In its five-year old existence in Dhaka, Hotel Sarina has earned its name as one of the leading hotels of the country. Lately a new jewel has been fixed in its crown: the hotel has been given the much-coveted Five-star status; Sarina is a success story in a city where good hotels are hard to find and even more difficult to manage. As the city is expanding and along with it developing the need for good hotels and restaurants, Sarina can as well become an example for many would-be hoteliers. The hotel has become the fourth hospitality property in the city and the first in the private sector, to be classified as a five-star hotel. According to Shahid Hamid, the Executive Director of Hotel Sarina, several factors come together to define the five-star status. "According to the International standard," he says, "One has to consider the attributes like the number of rooms in the hotel, the exact size and measurement of the rooms, a swimming pool at the hotel, a bar, gymnasium, restaurants preferably specialising in a variety of cuisines, 24-hour room service, hygiene and many more for a 5-star status. There is a huge document, which categorises all these points." Sarina has a number of restaurants catering to customers of many levels, belonging to different occupations. "For instance we have students and a much younger crowd coming in to eat at Summerfields," says Aslam Habib, the Manager-Sales and Marketing. A coffee shop, Summerfields offers breakfast and lunch buffets with a menu from all around the world including Bangladesh. For those on the run, preferring a quick meeting over a cup of coffee and light snacks, the Lobby Lounge is the perfect spot to enjoy a quick cup of coffee, tea and home baked patisseries. Amrit is probably one of the most popular restaurants amongst customers. 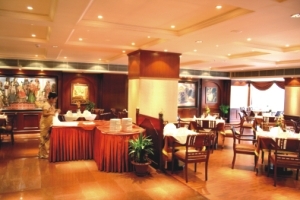 Located on the second floor, the restaurant defines sophistication. The restaurant has soft, live music, and offers Indian cuisines seven days a week. Located on the 9th floor, Picasso is a bar and an ideal place to unwind and let the stress seep away. It is filled with a range of cocktail, spirits and wines along with live entertainment. The latest addition to the family of restaurants is the Elite Restaurant, which has been set up specially for VVIP guests. "Starting from food, the overall ambience to the décor, the restaurant has a sense of uniqueness, simplicity and offers comfort to our guests," says Aslam. According to Shahid Hamid, there are certain local laws, which determine the 5-star status of the hotel as well. "For instance, according to the International standard, one of the requirements for a hotel to get the 5-star status is to have a full-fledged bar," he explains. "Many hotels in the Middle East do not have a bar due to religious and social laws, however they still have the 5-star status. The international law also says that a 5-star hotel should have a full-fledged nightclub. Many countries would not allow that." This newly acclaimed 5-star hotel also offers facilities like a gym and their very own travel agency. "Most of our guests are very health conscious and tend to work out during their free time," says Aslam. The gymnasium's facilities are offered primarily to houseguests. However, anyone can register for a membership with a payment of BDT 50,000 per year. The KSS Travels at Sarina accommodates the little changes in the travel plans of houseguests. This department is also efficient in booking tickets for theatre, musical shows and other seminars, which take place in other countries. Sarina also organises a regular cruise through Ashulia. "We live in a country where only one third is land," says the executive director. "The rest is water! We have been doing everything on land for a long time. Why not switch to water for a change?" People have had a chance to get the taste of a birthday party, a wedding and even an official business meeting on water. The hotel business has been thriving in this country over the past few years and Sarina can definitely stand as an example for all the developing establishments in this country.